Any information really helps us! Avoid Costly Hiring Mistakes and Sleep Better at Night! Whether you have twenty employees or 20,000, your business’ success is reliant on a safe and effective workforce. However, many employers place too much trust in their “gut” when making employment decisions. Often, this results in bad hiring decisions that waste the employer’s time and money, sometimes for years before the bad hire-turned-bad-employee finally leaves the company’s employment. By following the Seven Confident Hiring Decision Steps, you can put into place a screening process that begins with the job description, extends through the application and interview process, and only ends with the background check – greatly increasing the quality of your hires and reducing the frequency of your employee-related headaches. Discover how to quickly identity the level of risk associated with each applicant’s criminal record history – before they’ve even applied for the position! Create an employment application that collects the meaningful and actionable information about your applicants. Understand what you can – and can’t – ask applicants about their past employment, education, and criminal behavior, without giving applicants a chance to hide information they don’t think is relevant. Identify and screen for the key natural behaviors necessary to ensure success in your organization. Easily avoid the single largest cause of background check litigation against employers. 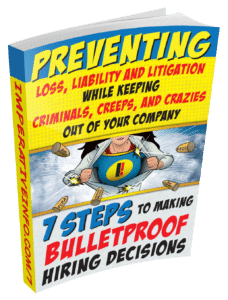 One simple choice leads to almost every one of the dozens of class-action lawsuits filed against employers each year related to their use of criminal background checks. If you want to jumpstart the Confident Hiring Process, get started today!